This book describes computational finance tools. It covers fundamental numerical analysis and computational techniques, such as option pricing, and gives special attention to simulation and optimization. Many chapters are organized as case studies around portfolio insurance and risk estimation problems. 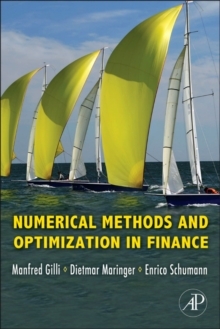 In particular, several chapters explain optimization heuristics and how to use them for portfolio selection and in calibration of estimation and option pricing models. Such practical examples allow readers to learn the steps for solving specific problems and apply these steps to others. At the same time, the applications are relevant enough to make the book a useful reference. Matlab and R sample code is provided in the text and can be downloaded from the book's website.